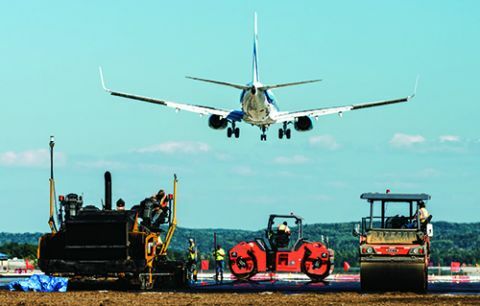 With the completion of an award-winning runway project at Cherry Capital Airport (TVC), Traverse City, MI, is well prepared to welcome travelers to Northern Michigan for the summer tourist season. The $14 million project renovated and extended TVC’s primary runway to 7,015 feet, thus remedying previous operational limitations. The 115-foot extension was the sequel to a 2013 project that extended the 6,500-foot east/west runway to 6,900 feet. Prior to the recent improvements, airlines had to lighten aircraft loads during summer months to achieve adequate lift during takeoff, explains Airport Director Kevin Klein. As a result, TVC’s three airlines (American, Delta, United) were taking penalties—up to 14 passengers for larger aircraft and three or four for lighter planes. In addition to sacrificing revenue, the carriers incurred operational complications by having to constantly monitor temperatures to determine whether they could carry full passenger loads. With the longer runway, carriers are now able to operate aircraft at optimum capacities, thus increasing their own efficiency and enhancing service for travelers. Although the project began with equipment mobilization and preparatory activities in early August 2017 and ended about three months later, crews completed most of the work during 24 days in September. Throughout the entire construction period, the runway was closed for only 14 days. During that stretch, the airport accommodated flights on its 5,378-foot secondary runway. The Michigan Department of Transportation-Aeronautics recognized TVC’s outstanding efforts during the fast-paced project by naming it the state’s 2017 airport of year. To prepare for the major September push, the general contractor on the project—Team Elmer’s—spent August staging equipment, setting up fencing and establishing protocols to meet security requirements. Crews also cleared and prepped areas for earthmoving operations, and installed conduit for the new lighting system. Simultaneously, improvements were made to a taxiway to ensure access to hangars and to the secondary north-south runway throughout the project. After breaking for the Labor Day holiday, the clock started ticking and the heavy work began. 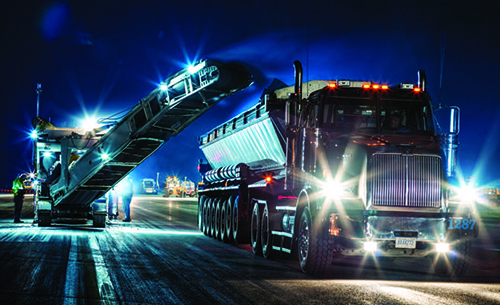 On the first night between midnight and 5 a.m., workers shortened the runway from 6,900 to 6,008 feet in order to keep it operational during the daylight hours. The threshold was moved and temporary electrical components and runway markings placed. Security fencing and barricades were erected to isolate the active runway area; portions of two taxiways were removed to install the new threshold bar and new blast pad. Throughout this initial 10-day period workers were on the job 24/7. The runway closed on Sept. 15. The intersection of the two runways was reconstructed and shoulder work within the influence of the two runways performed. To keep the north-south runway open during this period, much of the work was completed between midnight and 5 a.m.
From start to finish, workers moved 122,000 cubic yards of earth and placed 21,000+ tons of P-209 base material, 30,000+ tons of millings and 41,000+ tons of asphalt. All told, crews logged more than 38,000 hours of labor. Bob Nelesen, project manager for Prein and Newhof, kept his finger on the pulse of the rigorous schedule. “Not only was it 24-hour work days, but all of the contractors put on multiple crews per shift in order to accomplish the work,” he recalls. All of the old runway edge lights were removed and new cable and conduit installed, informs Mead & Hunt Electrical Engineer Bill Ropposch. LED upgrade kits were installed in all the signage, and a new precision approach path indicator (PAPI) and medium-intensity approach lighting system with runway alignment indicator lights (MALSR) put in place. Mead & Hunt also took the lead in environmental planning, land acquisition and obstruction removal for the project. Approximately 1,600 trees had to be removed or topped, and environmental mitigation and property issues resolved. Stephanie Ward, vice president and manager of aviation planning, worked with TVC’s legal counsel to acquire avigation easements for 54 properties, one of which was a mobile home community. Securing the legal rights to fly in the airspace above the properties, and also create associated aircraft noise, was a complex process that included boundary surveys, development of exhibits and extensive coordination with property owners, Ward explains. In the end, the project included about $2.7 million of improvements in the surrounding community. “We made it clear to homeowners that in addition to the easement payments, mitigation required them to return their properties to their natural states, but with trees that would not grow as high,” says Klein. When airport officials began discussing this project back in 2007, they projected that the runway would need to be about 7,300 feet long. The economic downturn in 2008, however, delayed the project. After the 400-foot extension in 2013, officials consulted with the airlines to determine whether their original 7,300-foot estimate was still correct. They learned that once the runway exceeded 7,000 feet, it was rated as having the same engineering performance value as a runway length up to 7,499 feet. With this new information, officials conducted another study, which ultimately indicated an optimum runway length of 7,015 feet vs. 7,300. This proved to be great news for the airport, because it allowed the project to remain on airport property and eliminated the need for extensive—and expensive—roadwork. Overall, the length change saved the airport about $5.5 million. The overall value of the runway improvements will become evident in the coming summer months, when aircraft are able to take off with maximum loads. It took a lot of coordination and communication, but everyone did a fantastic job, Klein summarizes. In addition, passenger traffic actually increased slightly during the height of construction.